I modelled most of Northam Park’s interior after that of Hagley Hall in Worcestershire. Both houses have Palladian exteriors in disciplined, classical straight lines. Hardly a hint of what lies on the inside, never failing to surprise the first-time visitor to these country houses. More on Northam Park, Diana and her guest next week. The story of Hagley Hall’s destruction warrants its own post today. 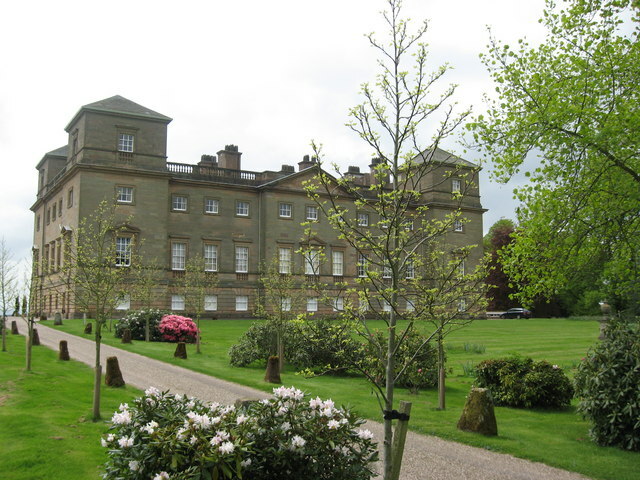 Hagley Hall’s mansard roof had caught fire from a defective chimney flue, pouring molten lead into the house. Amazingly, guests and neighbors mounted a spectacular salvage effort, going into the burning structure to save priceless treasures. By the time it was over, the state apartments, including the library, hall and dining room, had been ravaged, their interiors open to the sky. Lord Cobham went ’round the neighborhood, taking inventory of what had been saved and was stored temporarily. These included two thousand books, over one hundred paintings, including four famous Van Dyck portraits and four rare Shakespeare collections that had survived in the basement. Even the tapestries had been saved, cut from their mountings as the fire raged on. Fortunately for my project, Lord Cobham vowed to restore the mansion. Click on the link to go to the website for this beautifully preserved English country estate. Today Hagley is a masterpiece of meticulous restoration, still the glorious country estate of the viscountcy, but under a threat of a different kind and equally destructive. For a recent report on the condition of Hagley Hall, including a lovely photo of the restored library and the present viscount, click here. This entry was posted in Notorious Match, Regency and tagged English country house, Hagley Hall, Lord Cobham, Palladian by Angelyn. Bookmark the permalink. This brought back memories of our stay in London, when smoke was pouring out of the elevator of our hotel. We were awakened and ran out in the cold night air in our pjs. I know exactly how the Viscount must have felt! Hagley Hall is lovely. Yes—those old buildings are really tinderboxes. I shudder when thinking about a collapsing, molten lead roof.